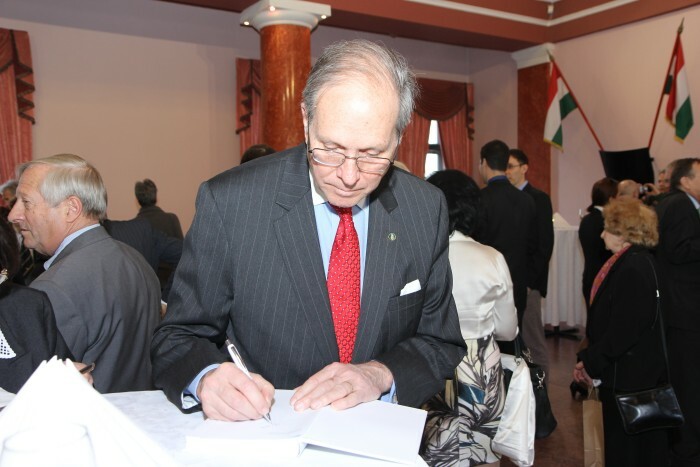 3/15/2015 - Book Signing in Budapest Honoring Holocaust Hero Col. Koszorus. 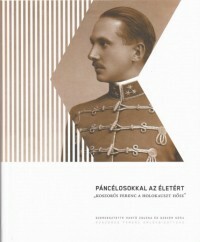 On March 10, 2015, a book signing and reception introducing an excellent volume, "Armored Soldiers for Life: Ferenc Koszorus a Hero of the Holocaust" ("Páncélosokkal az életért: Koszorús Ferenc a Holokauszt hőse"), took place in Budapest. 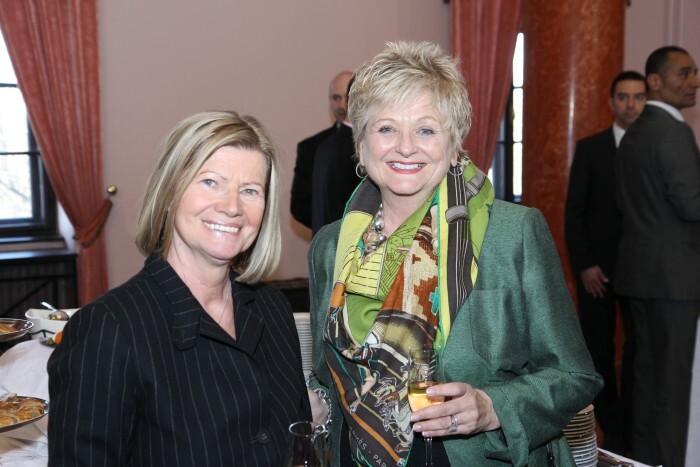 AHF was also a co-sponsor of the book. The book relates to Col. Ferenc Koszorus who in 1944 volunteered to militarily intervene with his First Armored Division to force the gendarmerie to leave Budapest, thereby preventing the deportation of approximately 250,000 Jews from the capitol to Nazi German death camps. 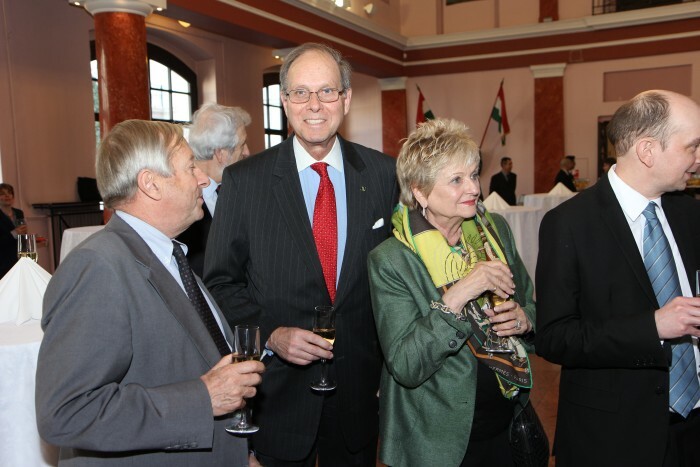 The Hungarian Ministry of Defense and the Ferenc Koszorus Memorial Committee sponsored the event held in the Museum of Military History in the Castle Hill district of Budapest. Dr. Zsuzsa Hanto and Nora Szeker edited the book, which Prof. Zoltan Kramar in his pre-publication contribution notes “is an outstanding, easy to read collection of essays that contribute to a deeper and morecomplete understanding of events that occurred during the Nazi regime and the ensuing Soviet occupation in Hungary, but which for seventy years have been largely ignored.” In addition to the essays, the book includes documents, photographs and a CD as well as pre-publication contributions by Charles Fenyvesi, Geza Jeszenszky, John Lukacs and Helen M. Szablya. 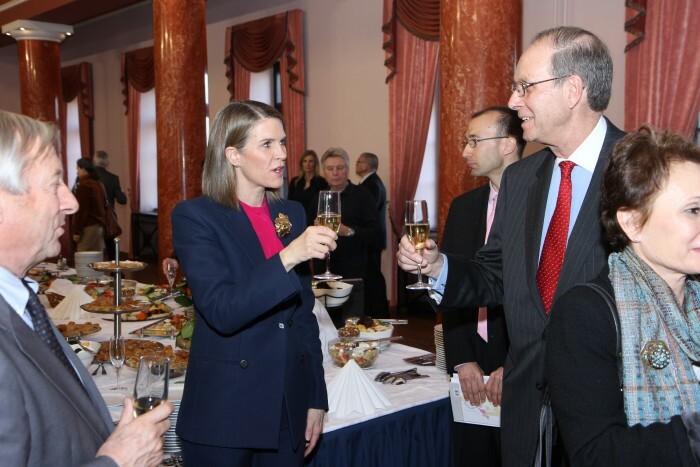 United States ambassador to Budapest, Colleen Bell, was present at the dignified and well-attended event along with several other dignitaries, including Geza Jeszenszky, former Minister of Foreign Affairs and ambassador to the United States; Gyorgy Szapary, former ambassador to the United States; and author, publisher and long-time sustaining AHF Kovats Circle Member Dr. Katalin Kadar-Lynn. 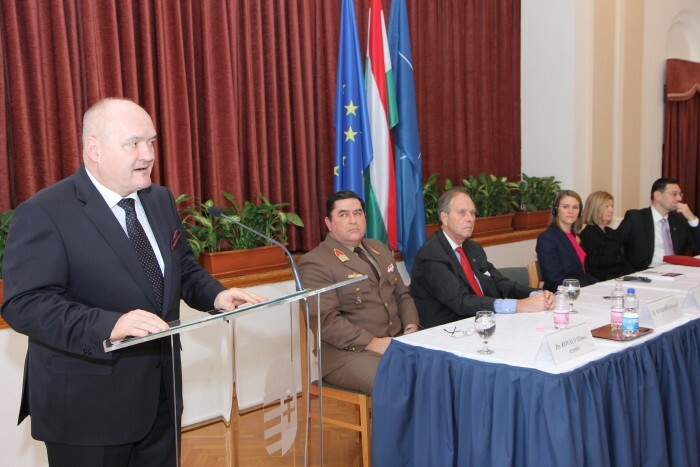 Minister of Defense Csaba Hende emphasized that despite the actions taken in the name of Hungary by Godless and inhuman murderers allied with the enemies of their country, Ferenc Koszorus demonstrated that there is a Hungary where oaths and human life are sacred. 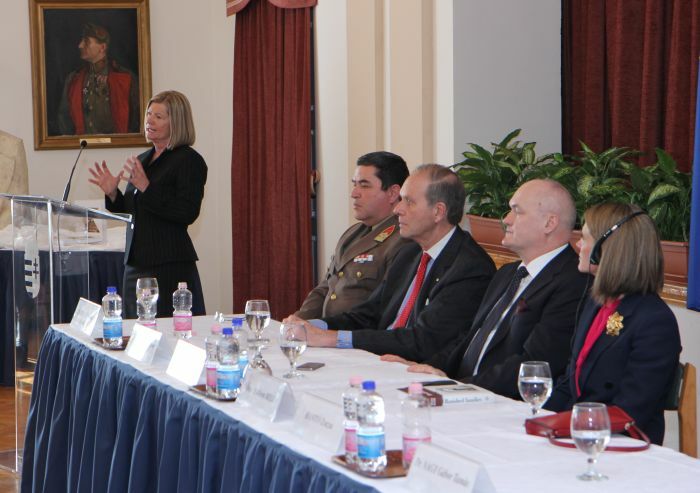 In her remarks, Dr. Hanto stressed that Hungarian historical remembrance unfortunately is divided and that the book’s purpose is to help end this division. 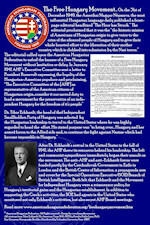 Frank Koszorus, Jr., president of the American Hungarian Federation and member of the Col. Ferenc Koszorus Memorial Committee, recalled that in 1944 Col. Koszorus wrote Hungary into the history books by being the only axis power that used military force to prevent the deportation of Jews when it blocked the expulsion of more than 250,000 Jews living in Budapest. He stressed that the victims of the Holocaust must never be forgotten, while the heroes must be remembered for the sake of historical accuracy and to serve as examples. Congressman/Holocaust Survivor Reminds that Those Like Col. Koszorus Who Struggled Against Nazis Must be Recognized. As the late Tom Lantos, Member of Congress and holocaust survivor keenly observed: "Too often the efforts of those who struggle against Nazi oppresion go unrecognized. This year , the 50th anniversary of Hungarian holocaust, the world reflects on the lessons learned. I am proud to honor Colonel Koszorus, a patriot, a humanitarian and a hero." Armored Soldiers for Life goes a long way to recognize, in the words of Prof. Kramar, this "soldier who [was] both a humanitarian and loyal to his oath and others who courageously resisted both German and Hungarian Nazis at a most treacherous time at great personal risk." The Federation is proud to have been one of the supporters of this important, highly informative and timely book. Col. Ferenc Koszorús, as the commander of Hungary’s first armoured division, thwarted a planned government coup dubbed the gendarmerie coup, which aimed to carry out the deportation of the Jews of Budapest on July 5 and 6 of 1944. Following the orders of Regent Miklós Horthy, Colonel Koszorús ordered his division into action against pro-Nazi forces on 5th of July 1944, preventing the coup and the deportation of hundreds of thousands of Jews from Budapest. The action delayed the Nazi takeover for 3,5 months, allowing tens of thousands to escape or find refuge and also permitted Raoul Wallenberg to coordinate his successful and effective rescue mission. 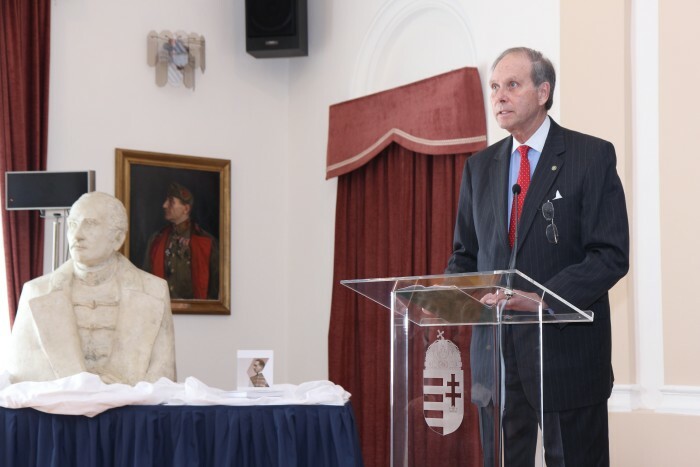 Colonel Koszorús’s unmatched action was the only known case of military action taken by an axis power to prevent the deportation of Jews, Ferenc Koszorús Jr, president of the American Hungarian Federation (AHF) said, citing the late congressman Tom Lantos. After blocking the coup, Ferenc Koszorús was forced to escape the Gestapo and fled to the United States where he would eventually serve his adopted homeland in the US Topographic Command. 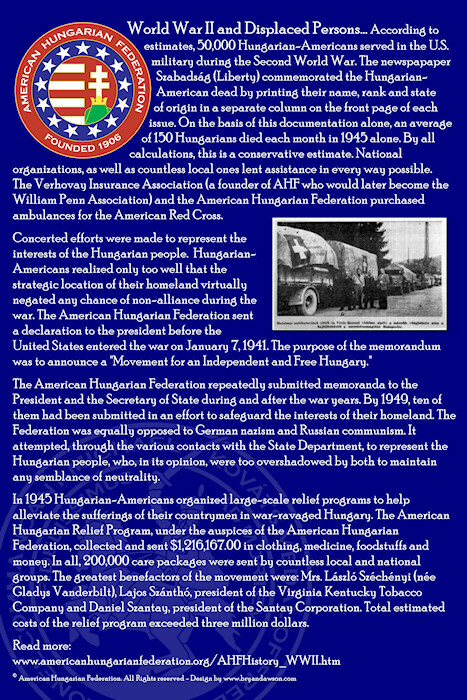 After the war President Truman asked him to organize Hungarian veterans in exile and train them for the eventual liberation of Hungary liberated and occupied at once by the Soviet Union in 1945. Despite strong election rhetoric of "roll back communism," the veterans in exile group was disbanded by the Eisenhower administration. Koszorus was posthumously elevated to the rank of general. [Read more] and see the Hungarian Review Article: "The Soldier Who Saved the Lives of Budapest's Jews: Col. Ferenc Koszorus." Hungary, heavily influenced by her fear of the barbarism of Russian Bolshevism and her desire to regain lost territories and reunite Hungarians in the Carpathian Basin, had found support in Italy and Germany and joined the Axis, a tragic mistake. As Nazi barbarism spread, thousands of Jews from surrounding states had found refuge in Hungary whose Jewish population exceeded 800,000 in March 1944. While the Jewish community in Hungary had reason to hope that it would be spared the fate of other Jewish communities in the countries surrounding Hungary and elsewhere, March 1944 changed everything as Nazi German troops occupied Hungary. In doing so they brought the Final Solution to the largest remaining Jewish population in Europe. Within months over 400,000 people were deported and killed by a now almost perfect mass killing machine. Hundreds of thousands Jews remained, most in the capital of Budapest. Nazi forces and their Hungarian collaborators needed to take the capital to complete their work. They were in for a surprise. When Hitler's patience ran out with the conservative leaders in Budapest and their peace-feelers and contacts with Western allies, Nazi Germany invaded Hungary in March 1944, drastically changing the situation of Hungary and the Jews. Hitler installed a pro-German government which collaborated with the Nazis occupiers and helped to destroy Hungary's Jewry, which had survived under the conservative government. Adolf Eichmann arrived to direct the deportation of Hungary's Jews so that by the end of June, virtually the entire Jewish population of the provinces had been deported. Until July 1944, the more than 200,000 Jews of Budapest were protected from deportation. Consequently, and at the instigation of the Nazi occupiers, Laszlo Baky, a secretary of state in the Ministry of Interior for "Jewish Affairs," planned to begin and quickly complete the deportation of Jews from the capital. Hungarians foiled that plan, however. 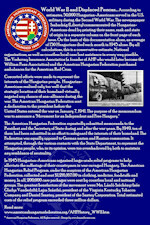 Following the orders of Regent Horthy, Col. Koszorus ordered his First Armored Division into action against Laszlo Baky and pro-Nazi forces in July 5, 1944, preventing the coup and the deportation of hundreds of thousands of Jews from Budapest.2 This unparalleled action was the only case known in which an Axis power used military force for the purpose of preventing deportations. The action delayed the Nazi takeover for 3.5 months, allowing tens of thousands to escape or find refuge and also permitted Raoul Wallenberg to coordinate his successful and effective rescue mission. But history was again not on Hungary’s side. A few short years later, she was under a brutal, Soviet-installed government. After blocking the coup, he was forced to escape the Gestapo and fled to the United States where he would eventually serve his adopted homeland in the US Topographic Command. President Truman asked him to organize Hungarian veterans in exile and train them for the eventual liberation of Hungary. President Eisenhower, despite the election rhetoric of "rolling back" Commnism, disbanded the unit before the 1956 Hungarian Revolution which surprised his administration. 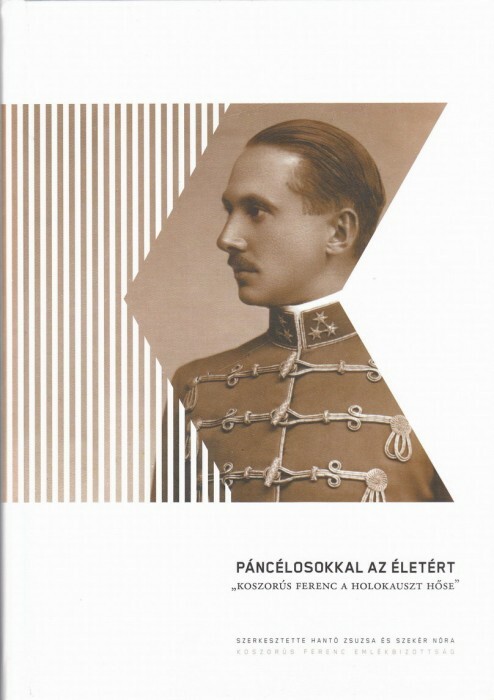 "The writings of Colonel Ferenc Koszorús contain wealth of fascinating and informative data relating to a critical period of Hungarian history. Based on personal experiences, his writings portray the tragic fate of Hungary during the Second World War, including the chaos caused by internal tension. These writings, moreover, not only chronicle certain key political and military events, they also offer solutions to exceedingly complex problems within the framework of high moral bearings, without which solutions prove to be ephemeral. Col. Koszorús military competence, expertise, and outstanding character enhanced his clear-sighted judgement. The selfless dedication he exhibited also characterized his family. He is descended from Transylvanian nobility, born into a family that voluntarily relinquished its special privileges during the Hungarian Revolution of 1848 in a demonstration of solidarity with the Hungarian nation. In this spirit, Col. Koszorús acted decisively to further the interests of his beloved homeland, motivated solely by a desire to serve the common good, even at great personal risk to himself. He was not drawn to any form of political extremism at a time when many could not resist the lure of seemingly simple answers to intricate questions or career advancement. In an extraordinary action taken in July of 1944, Col. Koszorús intervened to block an attempted coup by Laszló Baky. Koszorús's valiant effort preserved the remnants of the legitimate Hungarian political system, prevented the overthrow of the Regent, and thwarted the deportation of the more than 250,000 Jews concentrated in Budapest. Only in Hungary did a military unit employ force against an attempted coup supported by Nazi collaborators, the German occupation forces, and Adolf Eichmann. 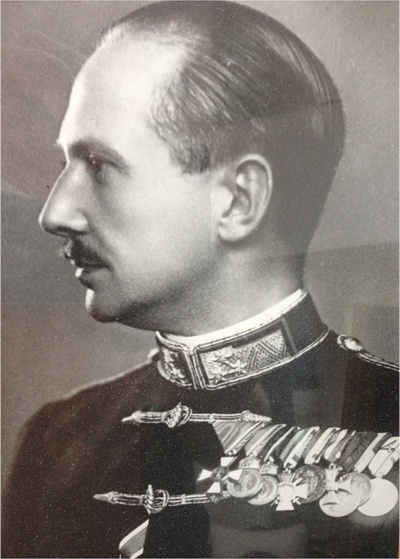 Col. Koszorús's merit was not only that he carried out the Regent's order at a time when such orders were generally disobeyed, but that he voluntarily offered his services to block Baky's perfidious act. He specifically requested the Regents order by way of the Commanding Officer of the Royal Guard, General Károly Lázár to preserve the legality of his intervention and thereby remain faithful to his oath. It was his unshakable convictions that "without trustworthiness there is no `soldier', without strict adherence to a soldier's military oath, there is no trustworthiness." After blocking the Nazi coup, Col. Koszorús was sought by the German Gestapo. To avoid certain arrest and execution, he first fled to western Hungary, and then after becoming ill he took a medevac train to Austria and ultimately to Bavaria. He arrived in the United States with his family in 1951, after which he continued to serve both his former homeland as well as his adopted country, working for the U.S. Topographic Command. In October of 1951, during the Truman administration, Congress authorized funds to organize and train legions of European immigrant veterans for the eventual liberation of their homelands. Finding Col. Koszorús to be untainted by either Nazism or Communism and judging him to be a reliable military man, the U.S. entrusted him with the task of establishing the Hungarian veteran armed force. In addition to his new career, Col. Koszorús continued to research and write on a variety of topics relating to Central and Eastern Europe. Out of modesty, he did not initially publicize his voluntary and historic intervention against the conspirators. Only after becoming aware of the misunderstanding and disinformation surrounding the Baky affair did he take the advice of friends and publish in 1961 his version of the events, so that "this episode be preserved for posterity in a factual and objective manner." 1 When Minister of Interior Ferenc Keresztes-Fischer learned the details of these actions, he ordered them to be stopped. 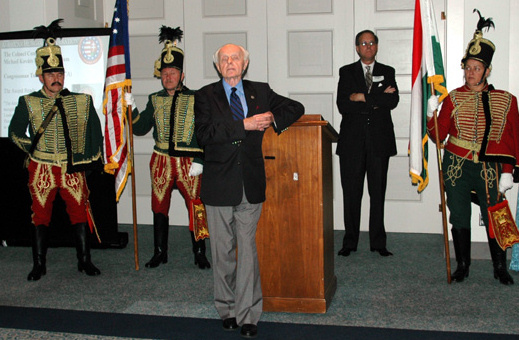 2 On the 50th anniversary of the Hungarian Holocaust, Congressman Tom Lantos (for whom one of the co-sponsoring organizations is named) referred to Col. Koszorus as "A Hero of the Hungarian Holocaust" and stated that "[a]s a result of his extraordinarily brave efforts, taken at great risk in an extremely volatile situation, the eventual takeover of Budapest by the Nazis was delayed by 3 1/2 months. This hiatus allowed thousands of Jews to seek safety in Budapest, thus sparing them from certain execution. It also permitted the famous Raoul Wallenberg, who arrived in Budapest on July 9, 1944, to coordinate his successful and effective rescue mission." As is clear from Congressman Lantos’ remarks, had Col. Koszorus’ intervention not occurred, Wallenberg would not have had many lives to save. Neither would have Lutz. Páncélosokkal az életért címmel Koszorús Ferenc posztumusz vezérkari ezredesnek emléket állító könyv jelent meg. A méltánytalanul elfeledett tiszt a II. világháború idején Horthy Miklós parancsának engedelmeskedve katonai erővel akadályozta meg a budapesti zsidók deportálását. Ezzel zsidó családok ezreit mentette meg a biztos pusztulástól. A könyvbemutatóra Amerikában élő fia is hazalátogatott. 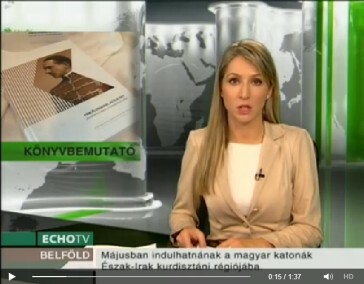 A mű létrejöttét az Echo Televízió is támogatta. "Páncélosokkal az életért: Koszorús Ferenc a Holokauszt hőse"
1944 nyarán lezajlott a magyar vidék zsidóságának deportálása. A magyar csendőrség német irányítóik legnagyobb megelégedésére nem egész két hónap alatt 437.000 már kifosztott és megalázott embert –zömmel nőket, időseket és gyerekeket, hiszen a férfiak munkaszolgálaton voltak - zsúfoltak példátlan durvasággal vagonokba és indítottak német haláltáborokba. Ez a sors várt Budapest zsidóságára is. Már megjelentek a főváros utcáin a hírhedt Baky László csendőrei és a budapesti zsidóság rettegve várta sorsa beteljesülését. És ekkor bekövetkezett a csoda! Horthy Miklós kormányzó utasítására Koszorús Ferenc vezérkari ezredes az 1. Páncélos Hadosztály harckocsi ezredével megjelent a város stratégiai pontjain és erélyesen utasította a deportálni készülő csendőrséget az elvonulásra. Ezt Baky - kénytelenségből és elkeseredve - meg is tette. Visszavonulóban, búcsúzásképen még gyorsan deportáltak a főváros környéki zsidóságot, akik közül több tízezren soha nem jöttek vissza, de a majdnem negyedmilliós budapesti zsidóság egyenlőre megmenekült. Ennek a hőstettnek állít emléket a most megjelent Páncélosokkal az életért „Koszorús Ferenc a holokauszt hőse” című tanulmánykötet, Hantó Zsuzsa és Szekér Nóra szerkesztésében. A könyv Koszorús Ferenc fiának visszaemlékezése után tanulmányt közöl Baky László puccskísérletének megakadályozásáról, majd a különböző ellenállási formákról és lehetőségekről olvashatunk, amelyek a nyilas hatalomátvételig akadályozták a totális fasizmus működését Magyarországon. 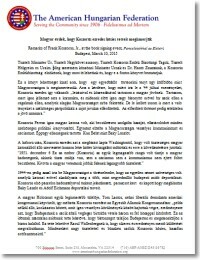 Lényegileg ezt a témát fejti ki nagy részletességgel a Magyar Függetlenségi Mozgalom tevékenységéről szóló fejezet, melyben sok névvel és adattal támasszák alá a könyv fő mondanivalóját, hogy igenis volt Magyarországon polgári és konzervatív ellenállás Hitlerrel és követőivel szemben. Sajnos következetlenség, konspirációs hibák és a diszkréció teljes hiánya eleve korlátozta lehetőségeiket. Zsidó tragédia eddig nem feltárt része a Szovjetunióba menekültek sorsa, akiket határátlépés miatt vontak felelősségre a szovjet hatóságok. Szabadabb, jobb életre vágytak és a Gulágra kerültek! Befejezésül a történeti visszaemlékezések egyoldalúságával vitatkozik a könyv, kiterjesztve vizsgálódásainak körét. Dokumentumjellegű munka, sok olvasmányos részlettel. Sajnos számadatai pontatlanok, a megmentett budapesti zsidók számát majdnem duplázza (van ahol 300.000-t említ), Romsics Ignác hadifogoly csere létszáma sem egyezik. Függelékben az auschwitzi jegyzőkönyv és más dokumentumok, valamint színes képmelléklet növeli a könyv használhatóságát. Sok újat tartalmazó értékes munka állít emléket e könyvben egy nagyszerű embermentőnek!